Indonesian politics is still unpredictable and that it makes it also quite interesting. One of the big surprises of the last time is the sudden political resurrection of the Sultan of Ternate in the N-Moluccans. This king with complete name:Sultan Drs. Mudafar II Syah Masjur Kamo Lano (usually known as Sultan Mudafar II Syah) won in the last april election for the national parliament a seat as a senator. A part of this parliament is made up of representatives special of their area and the people of a part of the area of the so-called Kesultanan Ternate, where the sultan stood candidate, choose him as their wished candidate to represent their needs and further things of their lives in the national parliament. Since 1999 the Sultan of Ternate experienced some political problems. Then the N-Moluccan province was being shaped and some blame him for being to ambitious in that process. After the reinstallment of the structure Moloku Kie Raha (N-Moluccans to be seen as the area of the 4 kingdoms) the situation went slowly but surely more better in the Moluccans. In 2001 Sultan Abdullah Syah was installed as new sultan of a resurrected (nominal) kesultanan (in fact heir of the dynasty) of Jailolo, so the complete structure of 4 royal families of 4 areas was complete again according to tradition. The Sultana of Ternate;Boki Dra. Nita Budhi Susanti Syah;was chosen in 2004 as the Ternate representative in the Indonesian national parliament. And she seemed to become that again in 2009. But suddenly Sultan Mudafar II Syah was favoured as a candidate and chosen;although he said to some people before, that he was already thinking of slowly but surely to witdraw for very active politics. But probably he tought, that when his people called upon him to help them, he only could follow the wishes of his people to try to serve them. 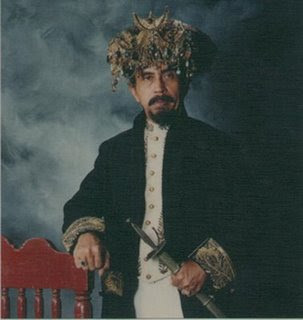 His former political so-called rival;Sultan Haji Djafar Junus Syah of Tidore (Tidore was historicaly from time to time a bit the rival of equal powerful Ternate) was chosen in 2004 already as the representative of the part of the so-called kesultanan area of Tidore, where he could stand as a candidate and in 2009 again. Only the Sultan of Jailolo, Sultan Abdullah Syah (complete name: Sultan Haji Abdullah Abdurachman Haryanto Syah) seemed to need more time to be rooted politically in his so-called kesultanan area. This is a very symphatic former army-officer known king just appeared the last 2 years in the political arena. He was not chosen, but at least his people knew then, what were his ideas and how he acted as a real politician. It is to be wished, that this warm personality also will be able to serve his people on a more higher level. So he will be seen in the future more;socializing among his people. We are greatfull to Mister Bayu Maulana from the USA;official private assistant of HRH the Sultan Mudafar II Syah of Ternate and the site okezone.com to provide us with some interesting facts about these N-Moluccans elections for national parliaments, in which 3 of the 4 kings were candidates. Although the age has changed but the power of local kings in some areas like in North Maluku Province still undefeatable. Two Sultans who followed the race in General Election 2009 to obtain the Senator seats mentioned get the absolute winner. Sultan of Ternate, Mudaffarsjah shows his power by winning in the half of Ternate and West Halmahera region, and in other sides Sultan Tidore, Djafarsjah as the incumbent participant won above 26 his rivals within Tidore Islands, Middle Halmahera and East Halmahera. within Tidore Islands, Middle Halmahera and East Halmahera. In Ternate, Mudaffarsjah won more than 40% or approximately 32.568 voters from 80378 legal voters. Sultan Tidore was able to reach 7.494 or more than 9,32 % within his three authority regions. He won 12.095 equal than 25% from 48.098 legal voters. One step behind of Djafar, the oldest son of previous Sultan Tidore “Taufik Rachman” with 7988 voters equal to 16.61%. The data above as a result of recapitulation entry in General Election Committee whereas just two regencies and two cities as mentioned at prior that has completed accounting process. Meanwhile, 5 regencies others have not submitted the data. Only one Sultan that totally failed, he is Sultan Jailolo Abdullah Sjah. From temporary data in General Election Committee his name listed beyond the big five. Provided that he loose in competition with Abdurahman Laahabato who gets 6658 temporary result.